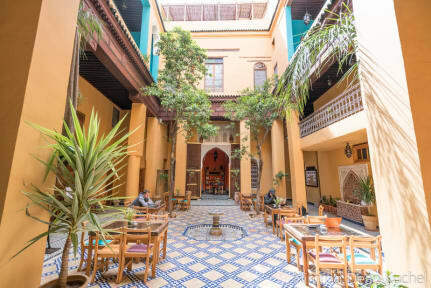 Very nice hostel, I wish I was in Fes for longer so I could have better enjoyed all of the offerings! Rooftop is amazing and the food is reasonable and excellent Moroccan cuisine. Note that the kitchen closes at 9:30. Lockers in the rooms require your own lock and are large enough to hold a small backpack (2x3x1ft). Showers were clean and no problem getting a comfortably warm temperature (had some issues with extreme hot/cold other places). 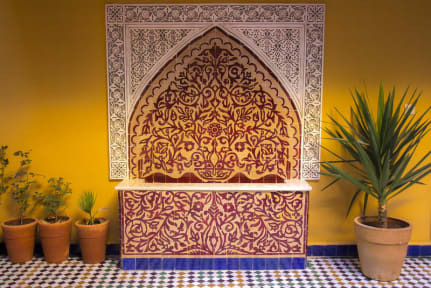 Beautiful authentic-Moroccan vibe hostel. Would recommend that place. Worth every dirham. Really loved Medina social club! It’s a beautiful hostel that’s kept very clean. Breakfast was included and it was really good. Located not far from the blue gates which was super easy to find. Signs are up making the hostel easy to locate. Staff was very friendly and helpful. Would definitely come back! We stayed in the Medina Social for 3 nights. It was perfect! It's really clean and the people there are so nice and welcoming. The breakfast is traditional moroccan and very delicious. We had an excellent stay here and the receptionist was extremely helpful, letting us print our boarding passes and helping arrange airport transfer. The driver Ashraf also deserves a shout-out for being so lovely! We got a triple bed room which came, to our surprise, with a private terrace. The roof terrace as well had a lovely atmosphere. Btw, alcohol is not served here despite what reviews say. Our one feedback would be more lights in the room as we couldn't see our stuff in the evenings. Medina Social Club is aesthetically beautiful! Check-in was great- the mint tea was a nice treat! You pay when you check out. My room had very thick, comfortable beds! Showers use solar panels to heat water- so don’t take a bath at night! No lock on bedroom door. The lockers are big enough for valuables, not your pack! Amazing rooftop terrace and view. Most hostels seem to sell food and drinks near cost; this one sells to make a profit. A kebab tagine cost 120; Coke: 15. No free walking tour! Nice location, clean and easy to find. Decent breakfast. Downside is you can smell the smoke from first floor throughout the entire building. Also, the bathrooms are in the rooms and vent only into the room. In Morocco the drain pipes are all open and the sewer fumes all vent into the bathrooms. Hostel was great but the tours they organize for you are expensive. If you’re looking for a free or affordable walking tour of day trip from the hostel, this isn’t the place. Overall, everything else was great but also got the perception that the hostel was looking to make a lot of money as opposed to many other hotels that try to keep costs down.